To promote the well-being of mankind through effective and inspiring grantmaking. Established in April 2002, The Oak Hill Fund (OHF) promotes the well-being of mankind through effective and inspiring grantmaking. We are located in Charlottesville, VA. 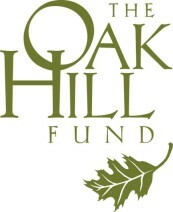 The Oak Hill Fund uses an on-line grant application process that begins with submission of a letter of inquiry. All letters of inquiry will be answered in a timely fashion. Please note that The Oak Hill Fund only awards grants to organizations that are tax exempt under Section 501(c)(3) of the Internal Revenue Code. The Oak Hill Fund prefers project-specific requests in lieu of requests for general operating support. The Oak Hill Fund supports overhead (administrative and fundraising expenses) required for the proposed project. Additional overhead, such as often established by colleges and universities, will not be considered. At present, The Oak Hill Fund does not support capital campaigns, endowments, individuals, bricks and mortar projects (excluding clinics under the WRHRJ Program), books or films. With the exception of the Diminished Tree Species Program, OHF does not support any research projects. As there are areas of overlap among our Programs, please feel free to submit an LOI wherever you see the best fit. If necessary, OHF Program Officers will move the request to another Program.